This product is a PDF download of the printed sheet music of Themes from "Scheherazade" by Rimsky-Korsakov from the Classics on Request, Volume 2 book by Barbara Brundage. Barbara has arranged Themes from "Scheherazade" by Nikolai Rimsky-Korsakov for intermediate to advanced lever harp players. It is in 1 and 2 sharps, and there are numerous flat and sharp lever changes within the pieces. There are no fingerings. This arrangement is specifically for lever harps, NOT for pedal harps. 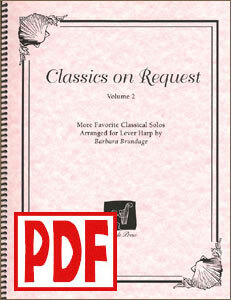 This PDF download includes a title page and 5 pages of music.